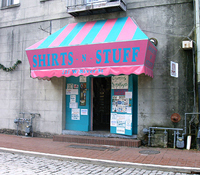 Thank you for visiting us at www.shirts-n-stuff.com. We are proud to offer some of the finest and most popular shirts and novelties available. Please feel free to browse our online store for some of our latest hits and values. Shirts-N-Stuff carries a wide variety of items for Wrestling, Rock-N-Roll, Orange County Choppers, Three Stooges, Savannah Souvenirs, Savannah T-Shirts, Atlanta Braves, Savannah Sand Gnats, Atlanta Falcons, Curious George, I Love Lucy, Mayberry, Scooby Doo, Hemp Jewelry, Retro/Hippy Stuff, Liquid Blue, Graphic Attack and Flappin Flags. We also invite you to visit our store on Historic River Street in Downtown Savannah, Georgia. Call us for the latest in Concert and Rock-N-Roll Tee-Shirts! Featuring bands like Tool,Slipknot,Bob Marley,Jimi Hendrix,The Doors,The Beatles,Aerosmith,The Who,The Blues Brothers and dozens more.